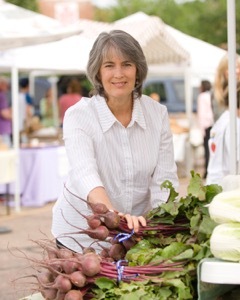 Chef and writer Deborah Madison is one of Chefs Collaborative’s founding Members. Our founders acknowledged their leadership in the celebration of food, and they recognized the impact of food choices on our collective personal health, on the vitality of cultures and on the integrity of the global environment. Everyone who loves to cook has a copy of Deborah Madison’s 1997 mega-bestseller “Vegetarian Cooking for Everyone” (and the more recently updated “New Vegetarian Cooking for Everyone”) in their cookbook library. She turbo-charged the vegetarian movement while expanding every food lovers’ understanding of the deliciousness of plant-based dishes. And Deborah was there at the start of Chefs Collaborative. “When I came home from the very first Chefs Collaborative meeting in Hawaii, I was pretty excited,” she recalls. “This was the first chefs group that cared about locally grown food.” A cook at Chez Panisse for two years before opening San Francisco’s Greens Restaurant in 1979, Deborah offered a farm-driven menu with produce from the restaurant’s own nearby farm, Green Gulch. She later opened Café Escalera in Santa Fe with Chez Panisse chef, David Tanis. Chefs Collaborative continues to do great work in New Mexico. “The other night I went to a Meat Matters dinner in Albuquerque co-hosted by Stephanie Cameron, co-publisher of Edible New Mexico. It was such a good program, so much valuable information. I don’t eat a lot of meat, but I am on the board of the Southwest Grass-fed Livestock Alliance and appreciate that we need animals to manage rangeland properly. These ranchers are working very hard to put water back on the land and to bring back native grasses. She’s stayed involved with Slow Food and served on the board of the Seed Savers Exchange and was a co-director of the Monte del Sol Edible Kitchen Garden in Santa Fe, New Mexico, and presently mentors a young woman in cooking from that school. “Chefs Collaborative’s mission still resonates loud and clear!” she says.